Default Brand Set the default brand that is used by the system when a user visits the frontend and a matching brand cannot be found (checks the URL). This will usually be your first brand. Admin Folder The name of the folder accessed to visit the operator panel, by default "admin". We suggest to change this value to something unique and unknown to users as an added security measure, so only operators will be able to access the URL. Enable SSL If you wish to force access to the help desk, frontend, operator panel and API, by SSL, enable this option. Please ensure that your SSL works before enabling it, as it may otherwise lead to issues with accessing the website. Pretty URLs This option will remove index.php from URLs and can be enabled if you use Apache where .htaccess is allowed in the directory, or an alternative web server with the rewrite rules converted from the .htaccess file. It should be disabled if you do not have Apache mod_rewrite or the rewrite rules do not work. Having the option disabled will just add index.php to URLs when accessing the base URL. Maintenance Mode If you are carrying out some work and/or wish for the frontend to be inaccessible for users for some time, you can use this option to disable the frontend. Remember to turn this option off afterwards. Cumulative Attachment Size Limit The total file size limit for all attachments that are sent in a single email, cumulatively counted. The system will try to fit what it can within the limit if there are multiple files to attach. A typical value would be 5M, which means 5 megabytes. Set to 0 to not send any attachment by emails and require users to download attachments via the help desk. Include Operator Name If you wish to include the operator's formatted name in the "From" field on ticket reply emails sent to the user. Include Department Name If you wish to include the department name in in the "From" field on ticket reply emails sent to the user. Email Method The method used for sending email by the system, defaults to the PHP mail() function. SMTP is also available and requires setting up further fields to connect with your SMTP server. Default User Country The country that is selected by default for the country field on the register forms. System Timezone The default timezone that the system operates in, set to the timezone that your company operates in. Date Format The format of all dates displayed by the system. Time Format The format of all times displayed by the system. Default Language Set the default language for both the frontend and operator panel. Language Dropdown If users and operators should have the option to change their language. Include Locale in URI Toggle to remove the locale e.g. /en/ from all help desk URLs. This option can only be disabled when there is only one active language in the system, it will not show otherwise and will be active by default. SimpleAuth Key The key used for SimpleAuth. We recommend a longer key, requires minimum 16 characters. Allow for Operators SimpleAuth is only available for users by default. You may activate it for operators also, but be aware that there can be security risks if care is not taken when implementing your SimpleAuth usage. Captcha Type The type of Captcha to use throughout the system. This will default to a normal Captcha that requires no configuration, but you can switch to Google reCAPTCHA which offers either a single click or no click (invisible) option. If switching, the site key and secret key must be set correctly and we recommend to verify it works after saving the settings. The Captcha can also be disabled throughout the whole system here. 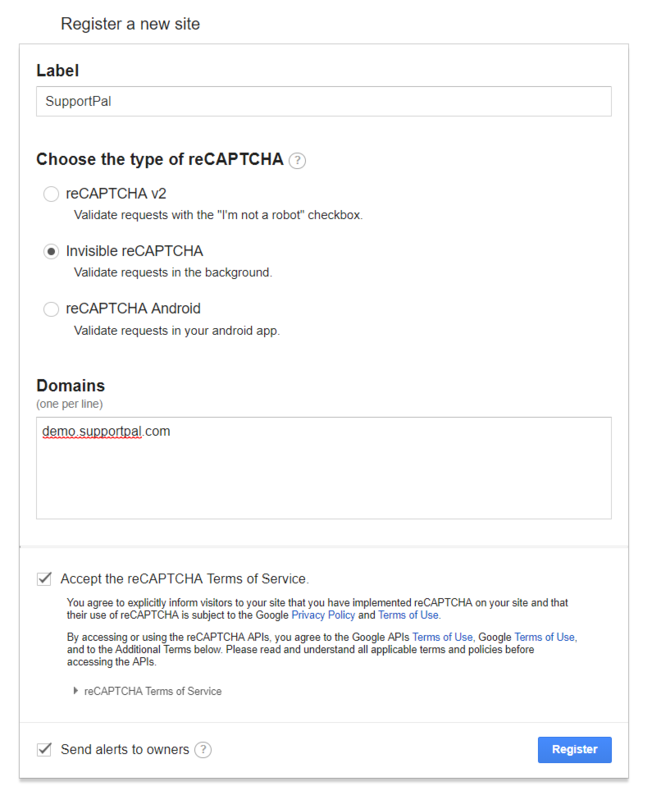 Visit the Google reCAPTCHA admin page, and scroll down to the "Register a new site" section. Enter a label for the site (it's not important) and select either reCAPTCHA v2 or Invisble reCAPTCHA. Enter the domain(s) (brand domains/subdomains) that the help desk is installed on, accept the terms of service and hit the "Register" button. The next page will show your site key and secret key. Visit Settings in the operator panel and click on the "Captcha" tab. Select the right Captcha type and copy over the site and secret key. Debug Mode Debug mode will display errors to the user. Only to be used if instructed by support or debugging the development of a plugin or widget. Errors are otherwise stored in /storage/logs. Send Diagnostic Data To help us improve our products, your help desk can send us diagnostic data when something goes wrong.